Howdy! Serena here. Today was the funnest day of the internship, yet! My fellow intern Isaac and I arrived at the studio at 7:30 a.m. sharp. We helped Jeff and Kirk load up the van with lights, cameras, and a trunk full of other film equipment to shoot a testimonial and B-roll at EduCare and Xavier High School. On the way there, I learned something new. Kirk taught me that certain film equipment is named after certain characteristics it has. For example, on a film set, clothespins are called C-47′s because that was the name the item had on the billing line. Other new terms include C-stands (bright silver stands with three feet), and stingers (short extension cords). It’s hard to believe this is only day 7 of my MVP internship! And the best is yet to come. What do I mean by that? One word: Twitter! 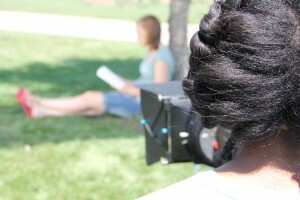 Look for some stills on the MVP Video Production blog!